You may have not been aware that Amazon was even running a second app store, in addition to its better known Amazon Appstore where it offers a selection of mobile apps for Android and Amazon Fire devices. After all, the Alexa app doesn’t even refer to its list of third-party software as “apps”, rather referring to these add-ons as “skills” instead – meaning, things that expand the functionality of the Alexa-powered Echo speaker. More interested in Fun things you can ask Alexa? Be sure to check out our 101 Fun Things to Ask Alexa. Alexa, in case you’re unaware, is Amazon’s own version of something like Apple’s Siri or Google Now. It’s a voice-activated assistant that lets you ask questions, create tasks and shopping lists, order things from Amazon, hear the news and weather, play music, set timers and alarms, and even control a number of “smart home” devices like lights and switches. Want Alexa to amaze you with her knowledge of pop culture. Check out our 101 Pop Culture Things to Ask Alexa. This list includes things like the health-focused 7-Minute Workout app; a voice-powered TV remote from AnyMote; news and weather apps from bigger names like AccuWeather, AOL, HuffPost, oh, and TechCrunch (disclosure! ); an app that reminds you where you’ve parked your car and how much gas you have left from Automatic; a recipe finder from Campbell’s; a bartender’s guide to mixing drinks; various apps to check local transit schedules; event guides from Bandsintown.com and the above-mentioned StubHub; stock quotes from Fidelity; a family locator from Glympse; a universal translator app; and even interactive games you play with Alexa like Word Master, Bingo, or Animal Game, for example. $40 for the dot on Amazon. Nice price for a Christmas gift. My folks may hate it, but I’ll set it up and we’ll see what happens. Love what I’ve seen it do so far, but need more specific instructions on the tasks it can perform, such as turning on my tv, lights etc. Just received the “DOT” .. The companion to The “ECHO”, so now woth two dots scattered throughout the house, ALEXA” is always syanding by for additional help and information. I feel as if Alexa and the entire family have just scratched the surface of the mamy numerous tasks she is able to do. Don’t think anout getting one or the other … a great product that you will use dailu and eventually become a member of your family. We love Alexa and you will too!! Grab onr up today and adopt a new family member for thr Nee Yeat. 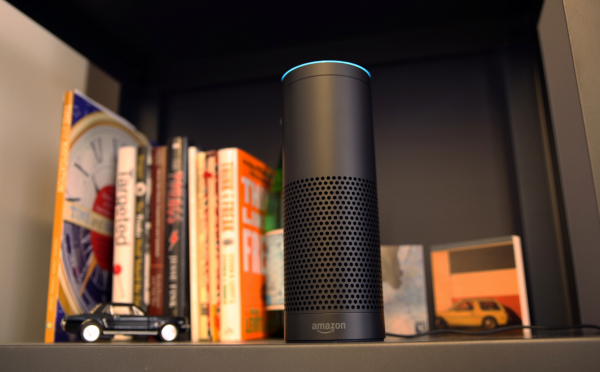 The companion to The “ECHO”, so now with two dots scattered throughout the house, ALEXA” is always standing by for additional help and information. I feel as if Alexa and the entire family have just scratched the surface of the mamy numerous tasks she is able to do. Don’t think anout getting one or the other … a great product that you will use daily and eventually become a member of your family. We love Alexa and you will too!! Grab one up today and adopt a new family member for thr New Year!! 96 Amazing Hours with Alexa Echo!